At the end of the 90’s a new City Garden was constructed on the grounds of the former barrack of heathland at the edge of the old town district and south of the historic French Garden. The great area is in the middle of the residential area and of the new town hall. The attractive composition through great surfaces of water, more than 70 trees, reams of bushes, hedges and flowers invite the guest to stay for all seasons. Beside play equipment such as slackline and turntables there are fitness-parcours for sports-enthusiastic adults. At the edge of the 2.200m² great surface of water there are numerous seating areas with benchs and a field where you can play chess. Further information about the City Park. Henry the Lion had this castle built in around 1175 as a residence inspired by the imperial palaces of the time. It was completely rebuilt following many alterations and fire damage from 1887 to 1906 in a historicized manner. 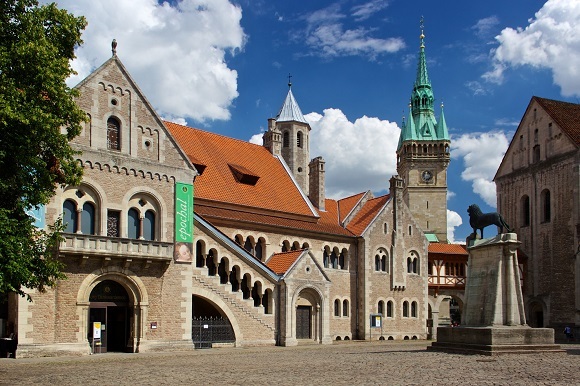 The castle now accommodates the mediaeval section of Herzog Anton Ulrich Museum: In the „Knappensaal“ hall, some of the Guelph treasures are on display as well as valuable liturgicalclothing and the original Braunschweig Lion. On the upper floor there is a splendid great hall. 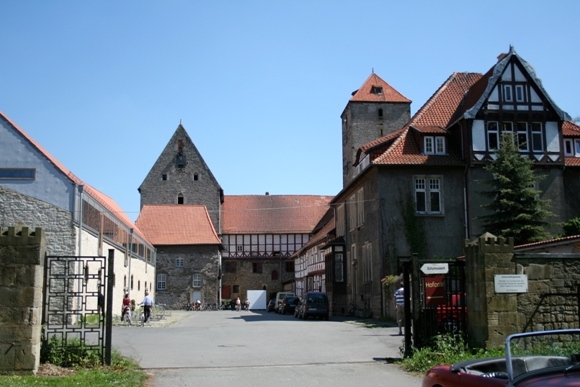 The historic manor complex with a 31 meter high castle keep is owned by the University of Hildesheim. You will find there the school museum and a cozy café. Students and Tourist will will get their Money worth at the Domain. 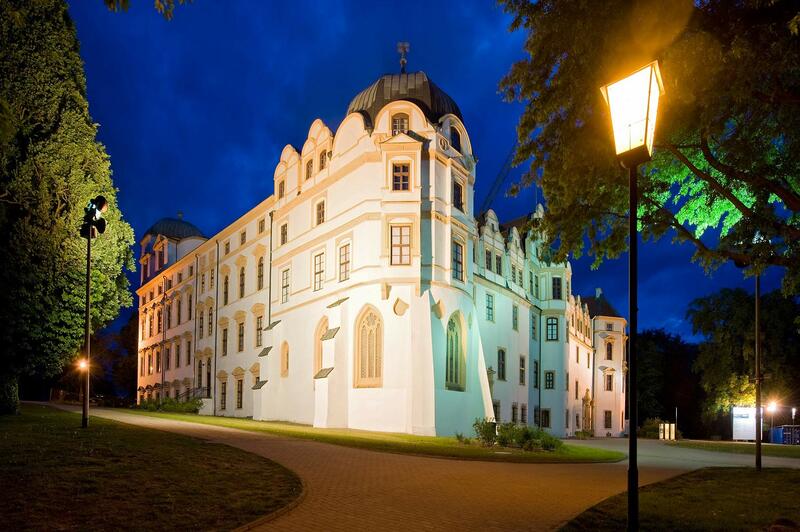 In addition, you can attend public exhibitions, theater performances, readings and festivals at the Domain Marienburg. 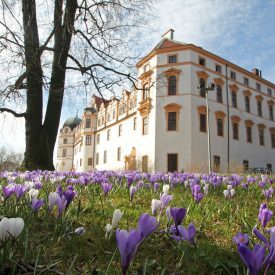 Besuchen Sie Schloss Hämelschenburg, eines der schönsten Schlösser Norddeutschlands und das Hauptwerk der Weserrenaissance. 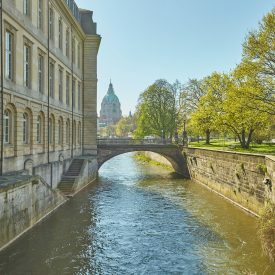 Der Park verbindet die Wallanlagen Hildesheims mit dem zentralen Naherholungsgebiet Hohnsensee. Im 13. Jh. legte das damalige Benediktinerkloster St. Godehard dort eine Weinanbaufläche an. Nach der Säkularisierung Anfang des 19. Jh. ging der Park in das Eigentum der Stadt Hildesheim über. 1843 wurde er an die Familie Dyes verkauft, die eine Villa erbaute und den Garten im englischen Landschaftsstil anlegte. Seit 1929 ist er eine öffentliche Parkanlage. The French Garden was probably named after the two French gardeners, Henri Péronnet (from 1670) and René Dahuron (1680 to 1701), who were in the service of Celle’s Duke George William. It was due to Dahuron that the first comprehensive kitchen garden and pleasure garden in the court tradition of the early 17th century were established. Between 1695 and 1696 a double row of lime trees was planted giving the park a dominant central east-west axis. This lime tree avenue was completely renewed between 1951 and 1953. In 1705 Celle ceased to be a ducal seat and consequently the park was neglected. Only in 1772, when the Danish queen Mathilde was exiled to Celle, the park sprung back to life under the auspice of court gardener Krantz. The initial square pond was converted into the present-day round pond. The French Garden also includes the Caroline Mathilde memorial which was created by the eminent painter and sculptor Adam Friedrich Oeser and erected in 1784 on the initiative of the Knighthood and the Estates. Soon afterwards maintenance problems reoccurred in the park. The thatched-roofed summer house erected for the exiled queen in the eastern section was demolished in 1801. It was only under the dedicated Hanoverian chief court marshall Malortie that the French Garden, based on plans by garden inspector Schaumburg, was gradually converted into an English-style landscaped garden in the mid- 19th century. After World War I a children’s playground was established in the eastern section which still exists to this day. In the western section however a small rose garden was created (renewed in 1996), and in 1927 the Regional Institute for Bee Research (nowadays the LAVES Institute for Apiculture) was built in the northern section which had been separated from the garden. Further Information for the French garden. Mitte des 18. Jahrhunderts wurden die Befestigungsanlagen abgerissen, so dass ein herrlicher Grüngürtel Wolfenbüttels um die Altstadt entstanden ist. Construction of the original Leine Palace began in 1637. From 1714, King George I had its interior reconstructed, with magnificent decorations. After a fire, the north-west wing had to be rebuilt. Further constructional changes were made by Georg Laves between 1815 and 1835. Among other details, he added the classicistic portico, resembling the example at Carlton House palace in London. 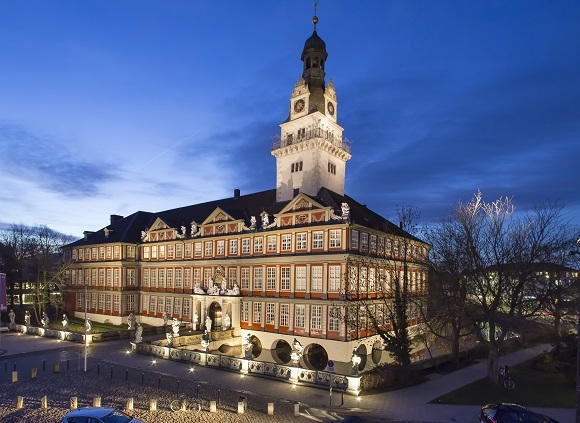 Today, the Leineschloss houses the Landtag – the state parliament of Lower Saxony, which is currently being renovated. 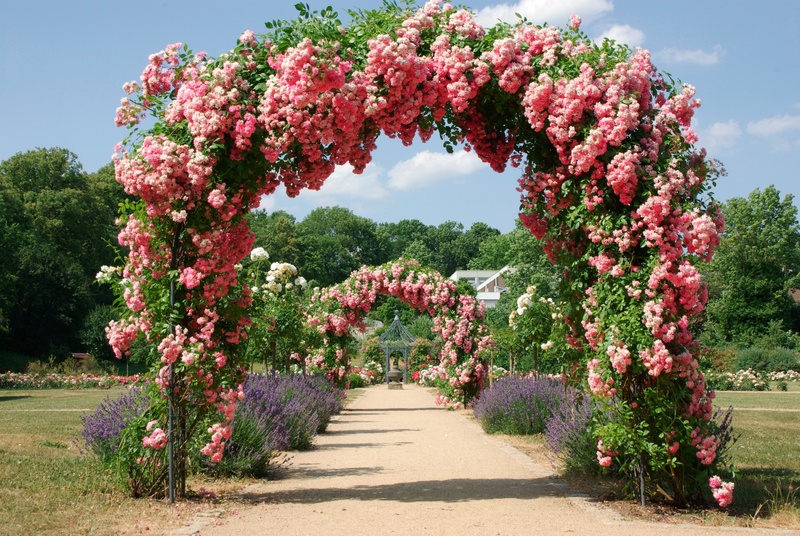 The central point of the Magdalenen Garden which was renewed in 2004 is the rosarium with 1.800 roses. 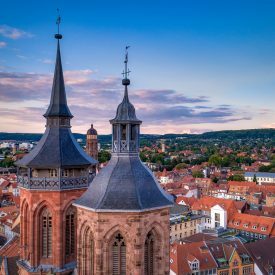 Worth seeing are the Weinberg, the old tree population and the impressive view of the UNESCO World Heritage Site St. Michaelis. 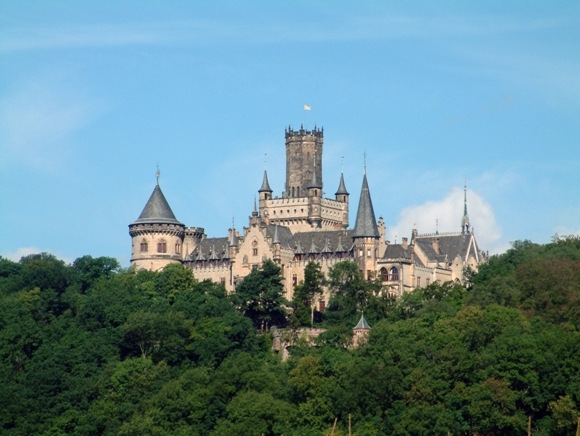 Like something out of a fairy-tale Marienburg Castle is perched on a hilltop near the town of Pattensen. It was the last summer residence of the Guelph Kings of Hannover and can be seen from as far off as Calenberger Land. The splendid neo-gothic palace was built by King George V in the mid-19th century as a gift to his wife Mary. Guided tours offer a fascinating glimpse of life behind the scenes. In summer, the Castle is used as a venue for live music and plays. The old coach house and stables provide a special ambience for the restaurant. 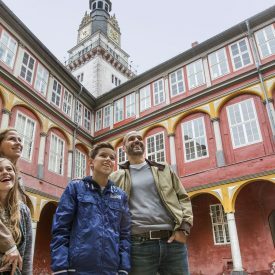 Special highlight: For the first time an exhibition at Marienburg Castle which runs until December 23th 2015 allows to admire the Kingdom of Hanover’s Crown Jewels. Celle’s Medicinal Herb Garden offers a wealth of diverse medicinal plants. The extended grounds – the garden is one of the largest of its kind in Europe – invites the visitor for a stroll amongst the fragrant medicinal plants and to rest by a bubbling spring. Information boards and individual references inform the visitor about the plants and how amongst others the famous clergyman Kneipp or the female mystic Hildegard von Bingen made use of them. 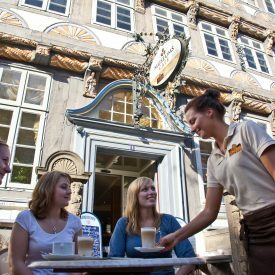 The attached “KräuThaer café” is operated by pupils from the Albrecht Thaer School. Home-baked products following old recipes delight the palate. Further Information about the Medicinal Herb Garden. The Old Botanical Garden invites people with its historical conservatories, the botanical areas and the old tree population, for a walk off the beaten track of the city centre. March-November daily 8 a.m. – 6.30 p.m.
December-February daily 8 a.m. – 4 p.m.
daily 8 a.m. – 3 p.m. The cornerstone for Herrenhausen Palace in the Grosser Garten was laid as early as 1640. In the following centuries, the building was redesigned several times, including changes by Georg Laves. He was the architect who gave it its final, classicistic look. Destroyed during World War II, it was finally rebuilt according to the original plans in 2013. It houses the Museum Schloss Herrenhausen as well as a modern convention centre. 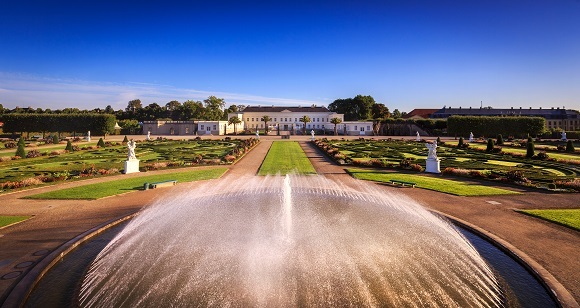 Find out more about the Palace Herrenhausen! 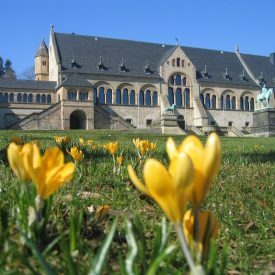 The Palace of the Guelphs is today the main building of the University of Hannover. 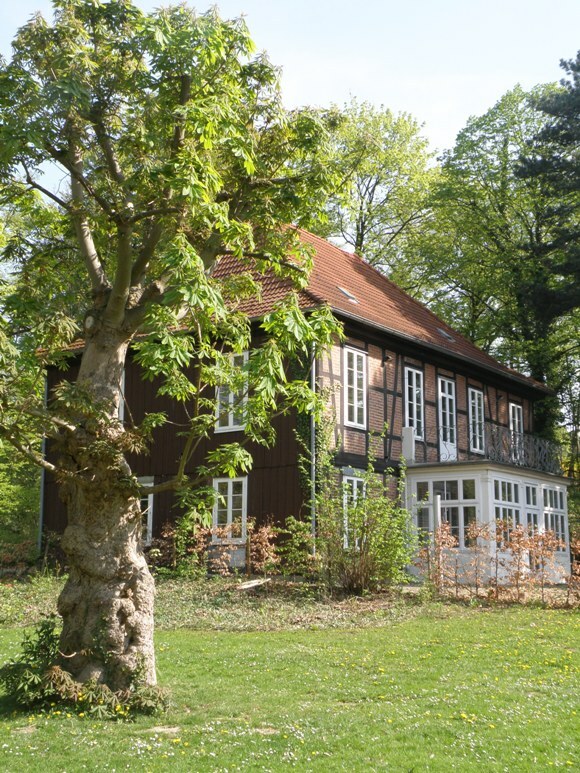 The palace is surrounded by the Welfengarden – a green oasis which is used by students and residents of the neighbouring quarter Nordstadt. In front of the palace the town’s landmark of Lower Saxony is placed – the Niedersachsenross (horse of Lower Saxony) which was designed by Friedrich Wolf. The origins of the Palace Park begin in the late 18th century, up to then the castle’s fortification had remained intact. Demolition began in 1784 at the western bastions and continued until 1827. The rubble was mostly filled in the palace moat which once was very wide reducing it to an average width of 6.7 metres. The newly gained ground between the Palace and the moat was then planted with trees and later used as a circular promenade with an avenue of poplars. When it was decided in 1839 to convert the Palace into the summer residence of the Hanoverian royal house, the lease of the grounds beyond the Palace moat were purchased. Under the supervision of Christian Schaumburg, the Garden Inspector in Hanover, extension works were completed between 1847 and 1866. The area in front of the Superior Court of Appeal, today the Regional Court of Appeal, were also integrated into the grounds. In 1868 the Palace grounds came under the supervision of the Royal Prussian Court Garden Administration. In principle the basic layout of the grounds at that time remains to this day. The western section became building plots in 1899, and in 1922 a memorial for German soldiers killed in World War I was erected on the central lawn in front of the eastern section of the Palace, but relocated in 1999 to the Town Park. In 1936 another section in the north of the grounds was given up when widening of the Mühlenstraße became inevitable. Today the Palace Park is a popular meeting point not only for the people of Celle but also for the many tourists who from this point start their guided town tour or who simply want to relax after a shopping trip. Further information about the Palace Park. Guests of Braunschweig win a special kind of an angle of view from the water. They can circle almost the whole city centre with a boat on the Oker river, surrounded by gardens and parks. Europe’s largest quadriga can be found on the portico of the residence palace. This palace, the residence of the Guelphs, was reconstructed in its original size and in its original setting, the Schlossplatz, with the help of old plans and historical photos. The adjoining shopping mall ‘Schloss Arkaden’ contains approximately 150 shops and restaurants. Further information about the Residence Palace. The palace is an excellent example of late Baroque architecture. The palace stunned its guests in olden days framed by the Richmond Park in style of english landscape gardens. Further information about the Richmond Palace. Unmittelbar neben der Klosterkirche Neuwerk aus dem 12. Jahrhundert ist ein stiller, alle Sinne anregender Raum entstanden: Im romanischen Garten wachsen auf erhöhten, von Bohlen eingefassten Beeten, Zier-, Nutz- und Arzneipflanzen, die andernorts schon lange verschwunden sind. 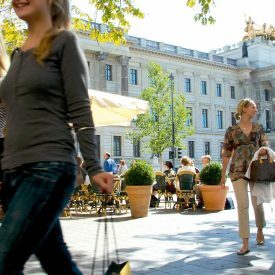 Beispielhaft für eine „barrierefreie“ Präsentation: alle Wege sind breit genug für Rollstuhlfahrer, die Informationen werden auch in Braille-Schrift angeboten. A place well worth looking at is the Ohrbergpark, situated to the south of Hameln up on the Ohrberg, especially at the time the rhododendron bushes flower in June. The view from this beautiful English-style landscape garden towards the river Weser is a delight. The Bürgergarten (“Citizens’ Garden”) is adjacent to the old part of Hameln. 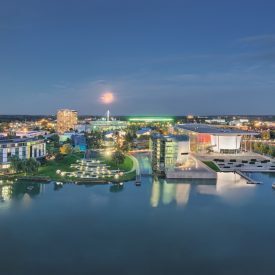 Apart from the Werder, it is the largest and most important park area in the centre of Hameln, a pleasure to citizens and visitors to the city alike. From April to October, waterworks are shown in the Bürgergarten several times a day. Directly beside Pfortmühle, a historic mill which is now the town library, a new bridge for pedestrians and cyclists connects the old town with the Werder, an island in the river Weser. An idyllic restaurant with large beer garden invites you to stay a while. Further information about the Schweineberg, Ohrbergpark and Bürgerpark. The Kurpark (spa gardens) in Lüneburg are worth a visit during all seasons. But things are probably at their liveliest there in summer. Apart from the gradation house, the shell-shaped bandstand and the herb garden, the large amount of lawn space is most attractive to people both young and old. Further information about the Kurpark in Lüneburg. 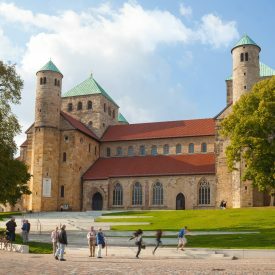 Visit also the Castles and Gardens of the region Hildesheim! Among the castles of Lower Saxony, the Guelph Palace of Wolfenbüttel occupies a special rank: It is not only the second largest of its kind, but is also home to the only high Baroque state apartments of the country.The mighty four wings served the local dukes from the House of Brunswick-Lüneburg over 320 years as a residence. From its shiny royal household announce today the splendor facade of the palace and the landscaped 1690-1740 state rooms. Tuesday to Sunday 10 a.m. – 5 p.m.